DC Comics will be releasing its solicitations for April on Monday at 5 p.m. (ET). Check back here then, for a complete rundown with images. To the right is a sneak peek at the cover to Green Lantern #11. Click on the thumbnail for a larger image. * The Ultimate Voice Talent Search. * What Avenger Are You? DVD-ROM game. * A first look at Ultimate Avengers II. 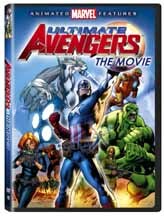 Look for more on Ultimate Avengers soon here in The Continuum. 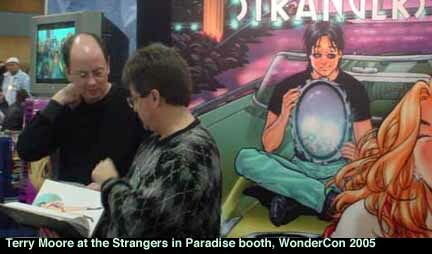 Terry Moore has announced that he is bringing his independent series Strangers In Paradise to a close with issue #90, slated to be released in May 2007. Moore makes the announcement in Strangers In Paradise #79, scheduled to be in stores on Wednesday. Said Moore, "After so many years and so much of my life invested in this series, I can hardly imagine doing anything else. But SiP is a story and, like all stories, must come to an end. "Now take a deep breath, grab a drink if you need it, and get ready for the ride of your life. This last arc is a killer." Strangers In Paradise, published by Abstract Studio, has won numerous industry awards, including the Will Eisner Comics Industry Award for Best Serialized Story and the National Cartoonists Society Ruben Award for best comic book. This story of the lives and loves of three unlikely friends debuted in 1993. For covers and four-page previews of upcoming titles CLICK HERE. Titles include Living in Infamy #2 from Ludovico Technique and Zed #7 from Gagne International. Look for more First Looks on Sunday here in The Continuum. * To the right is a first look at Battle Hymn: Farewell to the First Golden Age, a 152-page trade paperback from Image Comics that collects the mini-series by B. Clay Moore and Jeremy Haun. The book will feature more than a dozen pages of bonus material, including concept sketches and an illustrated essay on the origins of several Battle Hymn characters (some of whom will be appearing in a new series later this year). Moore and Haun will be reteaming on The Leading Man, a five-issue mini-series from Oni Press later this year. 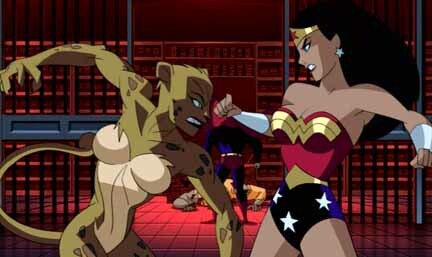 * Paul Storrie and Rick Burchett are the creative team on Justice League Unlimited #20. * Monday, Jan. 9 Justice League Unlimited, Marvel teams with Hasbro, Aquaman casting, SLG toys and First Looks. * Sunday, Jan. 8 The Batman, Justice League Unlimited and Ultimate Avengers. * Tuesday, Jan. 3: Wolverine: Origins, Justice League Unlimited, X-Factor, Pars Unknown and Dead Me Tell No Tales. * Saturday, Dec. 17: Street Fighter, X3 and First Looks. * Friday, Dec. 16: Image Comics for March, Avatar Press for March, Image Comics First Looks, November sales and UDON's Raw Editions. * Thursday, Dec. 15: X3, Marvel First Looks, DC First Looks and Ghost Rider movie. * Wednesday, Dec. 14: Marvel solicitations for March, Wolverine and the X-Men animated series and Teen Titans and Krypto schedules for January.